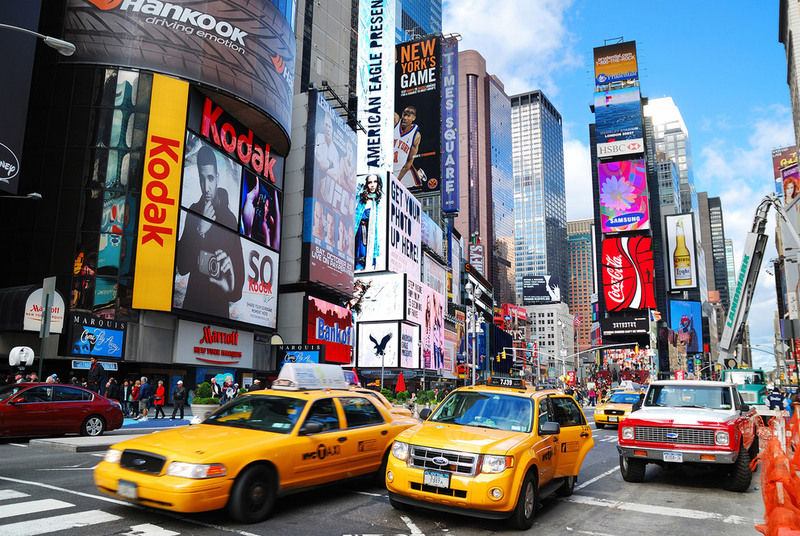 Times Square is known as the “Crossroads of the World” for a reason. We’ve mentioned before that the Royalton is the epicenter of New York and proof of that is that Times Square is one block away – not bad, right? Though a New Yorker is likely to deny going there (even if they do, they’re never going to admit it), the neighborhood has transformed over time. Today, it’s a 21st-century plaza where artists, contemporary design and special events converge. Read on to find out more. Let’s get down to it. Think of the intersection of Broadway and 7th Avenue as the nucleus of a loud, buzzing, neon neighborhood. Don’t be thwarted by the busy streets of this quintessential urban scene. Since the 90s, the Times Square Alliance has worked tirelessly to bring Times Square back to life. And it’s worked - more than 300,000 people visit it every day. Part of this extreme makeover was the construction of the TKTS Booth in Duffy Square (47th St and Broadway), where discount Broadway are sold like hotcakes. A set of large scarlet steps covers the booth with the brilliant idea to give visitors a bird’s eye view of Times Square. This particular spot has become one of the most Instagrammable locations in the city, so if you’re trying to find a never-before-seen angle or pose, you’ll have your work cut out for you. Super stores of global brands abound in Times Square, so indulge in some self-centered shopping. Although Times Square is always buzzing, the moment right before the clock hits 11:57 pm electrifies the atmosphere. Welcome to the Midnight Moment, for three minutes the billboards of Times Square showcase a different digital art exhibition each month. The New York Times is not only one of the most famous newspapers in the world, it’s where Times Square got its name from. When the newspaper’s headquarters were inaugurated in 1905, the name changed Long Acre Square to Times Square. Times Square stretches from around 53rd St to 41st St.
We are located on 44th St, just one block from Broadway and 7th Avenue. A tip from us to you: don’t discard Times Square in your next visit. New things are happening every day and, if it becomes too much, our Bar 44 will be waiting with a nightcap need before calling it a night in one of our cozy suites.